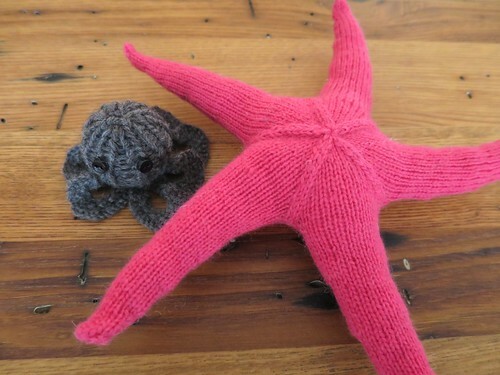 First I knit up the bright pink starfish. It was a bit of a design challenge for me because I wanted to see if I could knit up a stuffed star seamlessly. Then I did the little octopus. He is such a cute little guy and only took and afternoon. 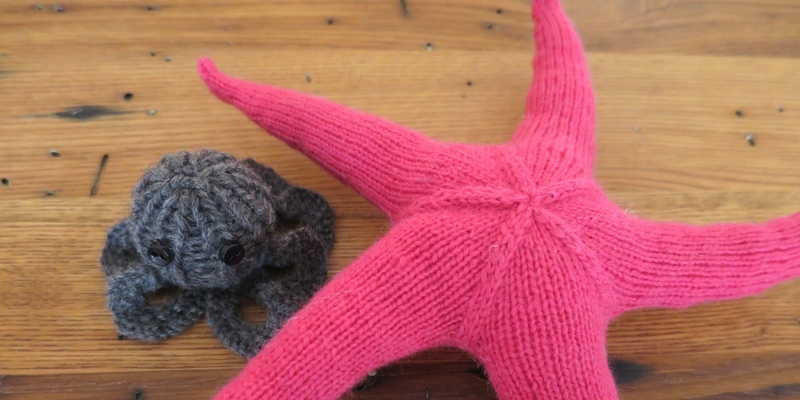 Today, I’ll share the octopus pattern and the starfish pattern will come separately later in the week. 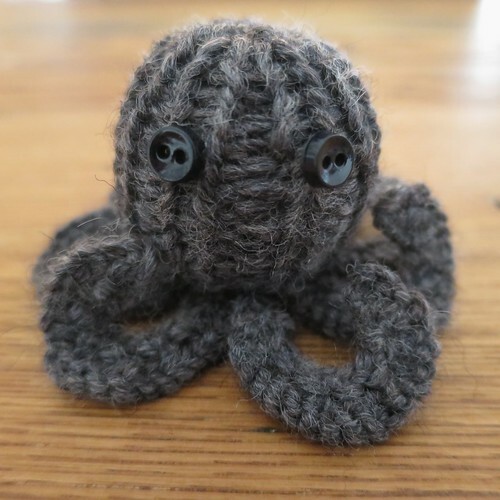 My octopus is mini, just 1 1/4″ tall and 2″ wide, but you can make him bigger by using thicker yarn or using more stitches. For instance you could make the body by casting on 30 stitches and knitting 30 rows, then cast on 15 stitches for the legs. Gauge: Gauge is not important for this project, you just want to make sure that it is tight enough that the stuffing doesn’t show through. With larger needles, cast on 18 stitches. Divide between three needles. Join together to knit in the round. Place a stitch marker between the first and last stitch to mark rows. Put your cast on tail on a tapestry needle. Weave through cast on stitches and pull tight to close. Weave in the end. Stiff the body tightly forming into a ball. Cut the working yarn leaving a 6-inch tail. Put on a tapestry needle, weave through the stitches on the needles. Take out the needle and pull the stitches tight to close. Weave in the end. With smaller needles, cast on 8 stitches loosely. Cut working yarn leaving a 6 – 10-inch tail. Weave in cast on tail. I wet my legs down to stretch them a bit and make them just slightly less curly, that is a design choice. Sew, glue or embroider on eyes. 5 years ago by Kat in Challenges , Iron Craft , Knitting , Knitting Projects , Needlecraft , Projects | You can follow any responses to this entry through the RSS feed. You can leave a response, or trackback from your own site. This is another project that just makes me smile. Although the octopus is cute, I covet the starfish. The color and everything about it makes me long for the beaches of Florida.I might have to plan a trip to Key West. Hmmmmmm. Dot, I hope you share your finished octopi (?) with us!